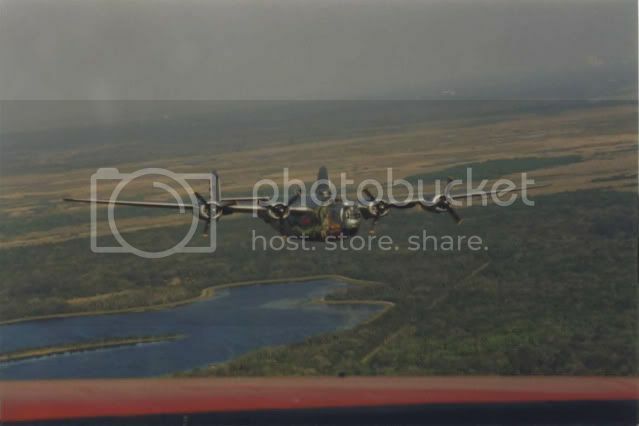 B-24J Liberator The Dragon And His Tail. Born from the need for a bomber with superior performance to the Boeing B-17, the Consolidated B-24 Liberator was designed around the low-drag Davis wing, and upon entering service had the longest range and biggest load carrying capacity of any other American heavy bomber in use at that time. In total, 19,401 Liberators were built making it the most produced American aircraft of the Second World War. The B-24J sub batch was the largest, with 6678 being built. Built in San Diego, 44-40973 saw service with the 64th BS of the 43rd BG. 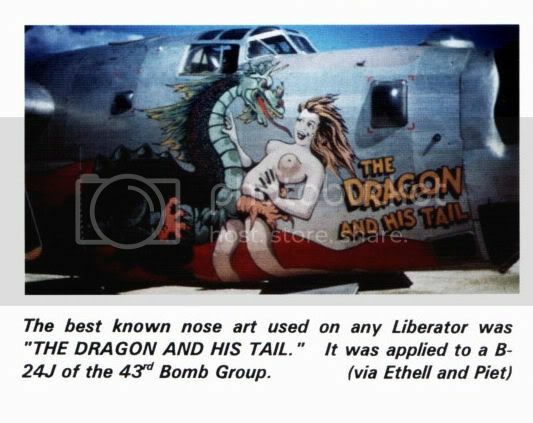 Many Fifth Air Force B-24's owe their spectacular nose art to S/Sgt Sarkis E Bartigal and The Dragon And His Tail was one of his finest works. 44-40973 survived combat, and was eventually scrapped along with over 2500 other B-24's at the Kingman storage site in Arizona. The workers at Kingman were so impressed by the artwork on this particular B-24 that it was parked close to the smelters and had the dubious distinction of being the last B-24 to be scrapped there. 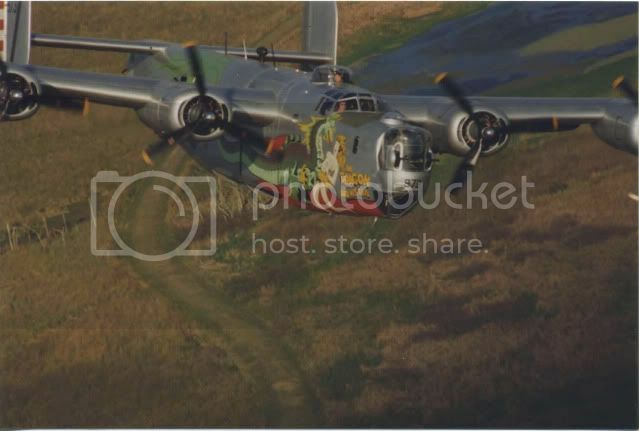 Thats not the end of the "Dragons Tale" though, as the Collings Foundation B-24 flew for a while bearing the artwork. So what do we find in the latest incarnation of the Hasegawa Liberator series? The kit comprises of nine sprues of the standard Hasegawa grey plastic and one sprue of clear parts. As we've come to expect from new releases, the moulds are crisp and theres no trace of flash. The detail and the finely engraved panel lines are extremely well done, but even with this high standard there are some parts where the detail really stands out. Highlights include the wheel hubs,the seven cylinder Pratt & Whitney R-1830-65's, and the tail section. Cockpit detail however, doesnt come up to these levels of detail but naturally isnt as visible on the finished model. A decal is supplied for the instrument panel but in this scale carefull dry brushing will probably look more realistic. The sprues include some parts marked as "not for use", and one of these is the nose glass area for a B-24D. Its not possible to build a D from this particular kit though as the nose section isnt included. The new B-24J nose section is moulded in clear plastic.As to weather this will make the window masking process easier or not is debatable. One thing that WILL make the window masking a lot easier though is that the windows are attached from the outside of the fusalage. Not only does this remove the need to mask them before painting but it also reduces the risk of inadvertantly pushing one through into the fusalage void. A nice touch is that the turrets(apart from the Sperry turret) are moulded as single pieces which can be added at the end of build. The option is given to build the model with the underside Sperry turret deployed or in the storage position. Two different styles of nose turret are supplied and both bulged and flush side windows are included. The bomb bay can be displayed in the open or closed position. Dont forget to pack plenty of ballast into the nose section.The instructions suggest 90 Grammes. offered in this kit. That assumes of course, that the modeller wishes to finish the model as "The Dragon And His Tail", and not one of the other six thousand plus B-24J's produced. I'm sure there will be many incarnations of this kit in the future, and each aircraft represented will no doubt be slightly different. "The Dragon And His Tail" is the only decal option supplied with the kit. The spectacular artwork is split into seven decals, and the main area of interest seems quite accurate when compared to a photo of the actual aircraft. Personally, I would like to have seen more than one decal scheme on offer for a kit with this price. The latest addition to the Hasegawa Liberator family features what is considered by many to be the most spectacular artwork ever to adorn a B-24. Weather the modeller chooses to depict the ww2 aircraft of the Collings Foundation it will be an stand out model in any collection. Lows: Only one decal option is supplied with this release. The same kit, with different markings is available from Hasegawa with a lower RRP. Verdict: If your heart is set on building The Dragon And His Tail, then you'll have to pay the extra for this latest release. Copyright ©2019 text by Nigel Julian [ LAMPIE ]. All rights reserved. Nice review of a great ship! Talk about the ultimate in 'nose art'! This has to be my most favorite nose art of all time!!!!! Nigel you are a lucky man.